It has to be now and always.. 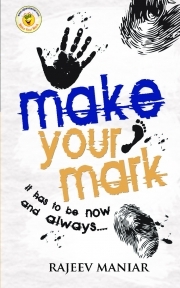 Description of "MAKE YOUR MARK"
This Book is all about creating a MARK in a LIFE. MARK? What is Mark? LIFE? What is Life? We meet a lot of people in Life. Have you thought about how many people we remember? Or perhaps how many people remember us? We remember those who have touched our heart and created a MARK. It may be once, but it has to be an everlasting MARK. It has to be a permanent MARK. A MARK which people will always remember! A MARK people are happy about. You create such a MARK which people would like to share about you with other people. This MARK has to have an intensity which is so tremendous that you are always on people’s minds. M – Motivation that will keep you motivated. A – Attitude which you should always display. R – Relationship to develop which works for a lifetime. K – Karma which will create a new life now which you wish for. lives will be with the same SOUL but in different forms like animals, birds or other living creatures. And when we have this one Human Form, what should we do that people around us and people who meet us remember us for a lifetime? It does matter what you do in this world, so whatever you do should carry a MARK - Make your Mark. Let’s create a MARK from this moment. Rajeev Maniar is a Mathematics Graduate From The M.S. University of Vadodara, Gujarat, and has an additional degree of JCI Designer from JCI University, USA. He has been an active member of Jaycees for More than 24 years and was the President of Gujarat, Zone VIII in year 2003. Emotional Intelligence so that they can approach life with a different outlook. Till date he has conducted more than 4000 training programs for corporates such as Tata Sky, Nokia, Divya Bhaskar, Airtel, Max Bupa, Vodafone, Idea, Reliance Life Insurance, Bajaj Allianz Life Insurance, Indian Post and Telegraph, Bank of Baroda, Citibank and many other such companies and also in schools and colleges. He has won the outstanding trainer of JCI award in 1999 and was awarded the RAVI PURASKAR in 2005, by JCI – Zone VIII. Rajeev is an effective speaker and a motivator. He is working as a life skills mentor and a trainer since the last 14 years. He also takes up assignments for various individual consultations. For more details about the author, please visit www.rajeevmaniar.com. Reviews of "MAKE YOUR MARK"